(05.07.2011) A military court in Portsmouth sentenced British conscientious objector Michael Lyons to seven months’ imprisonment today, following a two-day trial. Michael Lyons joined the Royal Navy as a medic in 2005, and in May 2010 he was notified that he would be deployed to Afghanistan later that year. Soon after, he applied for discharge as a conscientious objector, as he had developed a conscientious objection to participating in the war in Afghanistan in particular, and against war in general. 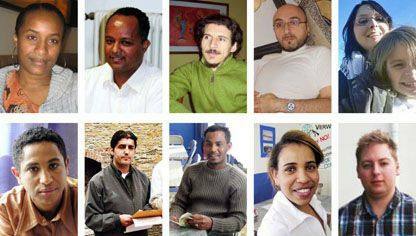 (18.12.2010) A medical worker in the British navy, who tried to exercise his right to claim a discharge on the grounds that he had developed a conscientious objection to continuing in the military, was refused recognition by a CO tribunal today. Michael Lyons joined up in 2005, aged 18. Since then he has stopped to think more about his work, partly prompted by researching information about the war in Afghanistan after being told some months ago that he would be deployed there next year. 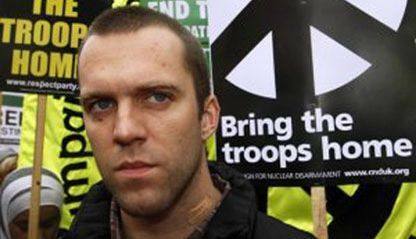 (28.07.2010) British soldier Joe Glenton, who was released from prison some days ago, spoke at a packed anti-war meeting in London yesterday. It was his first public appearance after his imprisonment. He demanded to bring back the troops from Afghanistan and added: „I consider it a badge of honor to have resisted and to continue to resist. I’ve learnt that the real enemy is not the man in front of you you’re pointing your rifle at, but the men directly behind you and above you telling you to pull the trigger.“ Joe Glenton was released on July 12th after serving a prison term for refusing to return to Afghanistan.